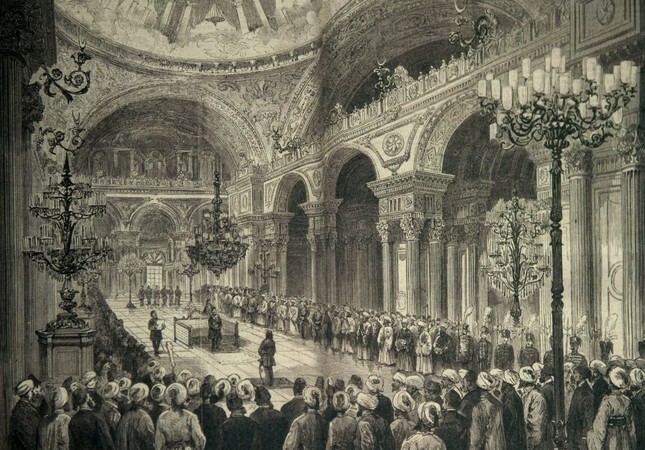 The illustration depicting the General Assembly of the Ottoman Empire constituted in 1876. Democracy means sovereignty of the people. The word derives from Greek, however, it was not a governing system favored by ancient Greek philosophers. They preferred elite rule, called the aristocracy, and drew attention to the danger of democracy turning into demagogy — the manipulation of the people through skilled politicians' verbiage. Nevertheless, today, democracy is seen as the most effective governing technique. An interest in ancient Greece arose during the age of the Enlightenment and people considered democracy a savior against oppressive powers. Although Greek democracy tended to lean more toward an aristocracy, the people did not seem to mind. In the end, the 20th century became the age of true democracy. The tradition of democracy in the Ottoman Empire is old. Local assemblies with financial, administrative and judicial powers have been established in the provinces since 1840. Elected by the people, they were composed of half Muslim and half non-Muslim members. The practice of local Ottoman democracy ahead of many European countries is quite noteworthy. All kinds of political, financial, legal and social issues in the provinces were negotiated and concluded here. With the declaration of the Constitution and the opening of Parliament in 1876, the Ottoman State adopted a democratic regime. Members of the local assemblies participated in Ottoman Parliament as deputies. Parliament — which was responsible for the defeat in the Ottoman-Russian War of 1877-1878 — was dissolved and elections were suspended for the next 30 years. In 1908, Parliament convened again, and the powers of the sultan were limited. The Sultan, like the present-day European royalties, mostly held a symbolic position. When the Ottoman State was demolished in 1922, it became a multi-party democracy in which even the socialist party was active. After the declaration of the republic in Turkey, the Republican People's Party (CHP) — which banned multi-party life and the freedom of press in 1925 — agreed to democracy in 1945 for the sake of getting American help to correct the ruined economy. However, the ruling party never regained the power it once possessed. Since then, democracy has maintained its existence as a guided and sometimes interrupted system. Prophet Muhammad, who emigrated from Mecca to Medina, was elected as the head of the state by the people. Thus, the Medina Site State was established. Muslim and non-Muslim people living in the city made an agreement that assured their mutual rights and privileges. Thus, the world's first Constitution based on written and social contracts emerged. According to Islamic law, the election of the head of state is ideal. As a matter of fact, the first caliph Abu Bakr became the head of the state this way. The head of the state could also choose his successor. The second caliph Omer was chosen in this manner, which is why monarchy did not seem contrary to Islamic law. Indeed, the Quran tells the story of Prophet David's son Prophet Solomon succeeding David. Everyone who met the minimum requirements could become a monarch. Since it is not possible and beneficial for everyone to participate in this election, it is sufficient for the scholars and statesmen residing in the heart of the state to choose the sovereign. The early Ottoman sultans were chosen by the scholars, heads of the tribes, chiefs of the craftsmen associations and commanders. Here, a choice from the same family was worrisome. The power of the Ottoman sultan was not more than their European counterparts, and even less than today's U.S. president, because, according to Islamic law, the ruler is subject to the legal principles that have been placed around him and lacked the authority to change them. The ruler is obliged to comply with the principles of the law, that is, the justice in practice. A ruler who moved away from justice lost his legitimacy. The ruler reigned but did not govern, instead he performed executive and judicial functions through the representatives, of whom he was authorized to assign and depose. The sultan could freely rule in matters where Islamic law had not made provisions, and could make law, but not arbitrarily. He had to look after the interests of the public (maslahah). This principle extends beyond classic democratic understanding because the majority may want something contrary to their own well-being. The principle of public interest does not mean looking after the will of the majority, but rather the rational interests of the whole community. For example, forcibly purchasing the property at the side of the road to broaden the road is a manifestation of the principle of public interest. It is against the law to forcibly alter someone's property without just reason. The ruler consulted with those who were knowledgeable and experienced while fulfilling his duties because the Quran requires "consultation." However, it is not possible for everyone to be involved in this consultation. The ruler also had no obligation to comply with the views that arose from the consultation. He gives a decision he thought was right and applied it. Prophet Muhammad and his friends acted on this path. The councils in the Ottoman State were based on the principle of consultation. However, there has been controversy over who the "they" pronoun mentioned in the Quran's verse (Alu İmran: 159) "Consult them in your work!" was. Because the majority may not always know what is best for the people, the reign of not the majority, but of those with knowledge and experience is important in Islamic law. Various verses in the Quran say the majority does not hold any value: "Those who fit the majority of people go astray!" (An'am: 116); "Most of them are unbelievers!" (Nahl: 83); "Most of them are sinners!" (Maide: 49); "Most of them are associators (of others with Allah)!" (Rum: 42); "Most of them do not believe!" (Ra'd: 1); "Most of them are disbelievers!" (Isra: 89); "Most of them are careless!" (Yunus: 92). The Ottoman Parliament was not just a consultation council, and utilized legislative power similar to the examples of the national Parliaments in Europe. The laws that they prepared passed with the signature of the sultan. Perhaps he could not create whatever laws he wanted, but he also had the right to block the laws that he did not.